Andréanne Abbondanza-Bergeron says the goal of her practice is to reignite a more conscious awareness of our surroundings. Typically, her art begins not in her studio, but within a given architectural space. 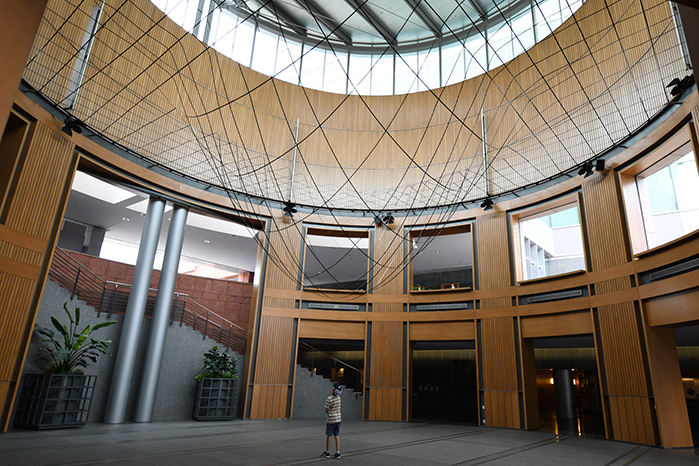 CAFKA was pleased to be able to invite her to develop a work for the Rotunda of the Kitchener City Hall, one of the most dramatic interior spaces in the Region. Andréanne came to Kitchener in the summer of 2017 and spent some time in the Rotunda. For CAFKA.18 she created a large installation suspended from the Rotunda ceiling. Andréanne's work, Tipping Point, reproduces the structure of the roof in a linear topography. Her installation is intended to resemble a topographical drawing in space. To do this the artist is using industrial steel strapping as line. The steel strapping is attached in parallel and at regular intervals to the structural bar that circles the room on the wall, creating a cross-hatch pattern, forming at the edges a regular weave, sagging into a deep pocket in the centre. The structure describes the volume of the overhead space, but also forms, in its shape, a counterpoint to the flat-topped cylindrical rotunda. Tipping Point has been made possible with the support of NEO Architecture.